It's not often, or at least it wasn't until recently, that the music world and the geek world combined in glorious fashion. But when they do, you'll want to "Shout It Out Loud." 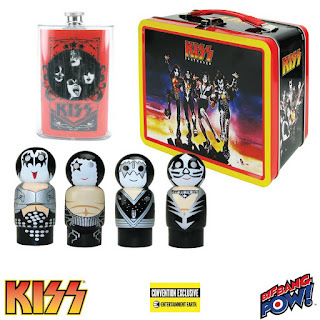 And you don't have to be a card-carrying member of the KISS Army (but if you are, it doesn't hurt) to get this amazing KISS Destroyer Tin Tote Gift Set - Convention Exclusive! Bif Bang Pow! has done it again with several amazing collector's items all in one tin tote. The fantastic 4-color full-size tin tote is unlike any other Destroyer tote ever made, in that it not only features the iconic album cover artwork, but also showcases rarely seen and vivid photography of the band from that era on every available side! Open the tote and you're hit right away with a 5 oz. stainless steel KISS flask for... well, beverages. But there's more, you'll also get four individually packaged Pin Mate™ figures. 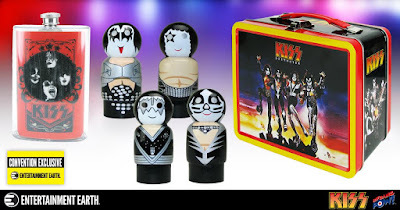 There's a retro-styled 2-inch tall wooden figure of The Demon, The Starchild, The Spaceman, and The Catman, each boasting brightly colored, 360-degree artwork of the band member in costume and makeup. The tin is individually numbered with a holographic sticker. Ages 14 and up. There are a limited number of 360 sets, so you'll need to act fast. KISS fans will need this item to complete their shrine to one of the most memorable bands in music history. Pick this tin tote gift set up at San Diego Comic-Con to become the "King of the Night Time World" and have your own "Rock and Roll Party" with this tote and everything that comes inside. That's enough KISS puns... GET IT NOW! The first opportunity fans can grab this individually numbered and limited-edition exclusive will be at San Diego Comic-Con on July 20, 2017 in the Entertainment Earth booth (#2343)! Not attending San Diego Comic-Con 2017? Click HERE To Pre-Order KISS Destroyer Tin Tote Gift Set - Convention Exclusive from Entertainment Earth!